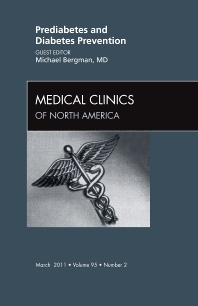 This issue of Medical Clinics devoted to prediabetes and diabetes prevention belongs in the hands of every practicing internist, PCP, hospitalist, nurse practitioner, endocrinologist, and any healthcare provider who is concerned about the diabetes epidemic. The importance of this resides in our ability to prevent diabetes by early identification of individuals with a precursor condition termed prediabetes that affect 54 million adult Americans. This entity has grown globally over the recent decades paralleling the obesity epidemic. No country or region of the world is immune. Overweight and obesity affect approximately 60% of our population and children as well as adolescents are not spared. Approximately 13% of adolescents have prediabetes which has doubled since the year 2000. Both type 2 diabetes and prediabetes are preventable and reversible with lifestyle changes involving weight loss and exercise. This issue gives a historical perspective on diabetes prevention, examines its public health implications, and explores diabetes prevention initiatives. Essential topics covered include prediabetes definition, epidemiology, mechanisms of complications, pathophysiology, diagnosis, and treatment recommendations. Diabetes prevention trials and the economics of prevention are also covered.